Everton have signed 18-year-old striker Bassala Sambou from Coventry City. Sambou refused to sign his first professional deal with his home town club, opting to take a chance on a Premier League move to Everton. Sambou has caught the eye with 25 goals this season, most of which have come for the Under-18s in the league and FA Youth Cup while hitting four in the Under-21s. 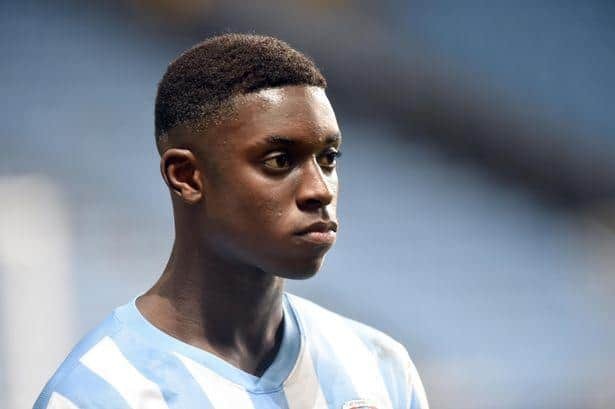 Coventry City Manager Tony Mowbray had offered the teenager a route into the senior squad at the Ricoh Arena by telling him that he would be part of the club’s pre-season plans where he’d get an opportunity to push for a place in the first team. “We are just a victim of when players come out of their scholarship and there’s a natural gap between their first year professional contract and there’s a window of opportunity to leave if they want to,” said Mowbray, who revealed that City offered him more than the going rate to keep him. “They have taken up that option not to sign after we made a pretty good offer beyond what we might have offered normal scholars. He’s a young boy with huge potential and yet they want to go down another route. “I had long chats with him and his advisors and think the career path would be much better at this club than going to the Premier League and finding himself in a pool of 20 or 30 under 21-year-olds all striving for the same thing and where he might never surface, of course, whereas here I think he would have possibly been around our first team squad and maybe off the bench and getting some first team minutes next season.